This is delightful from beginning to end, Linda! Thanks for the walk through--gorgeous tag! Really cool with all those layers..but, what did I expect from the layer Queen? lol...beautiful! Wonderful tag, Linda. Thanks for the great tutorial showing how to combine Distress, Dylusions and Paper Artsy products together. A big help. I always have trouble with the Distress pinks but I'd best practice again.And you're so right - we are all we've got. This tag is just beautiful, and so romantic! I love how you combined everything. Nothing wrong with being sentimental! Beautiful tag! 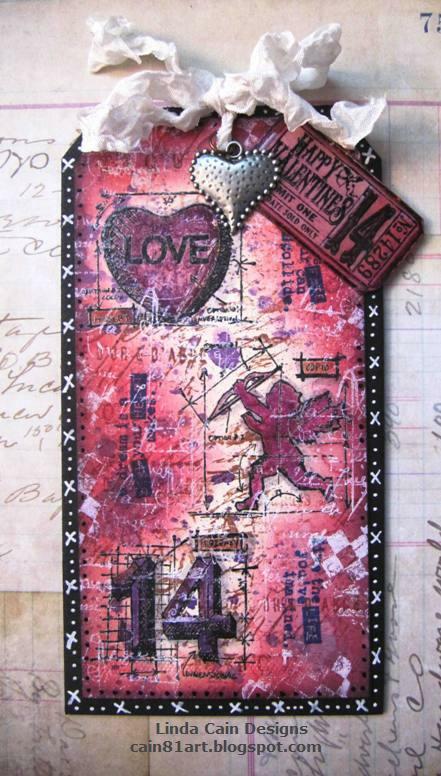 Really cool layers and the stamps are cool too! Beautiful tag! Love the results of the blending and mixing. Happy Valentines Day! So much to love here...the bold black border that draws the eye all the way around the tag...the fabulous heart pendant suspended artfully from the bow...the fun love ticket, the prancing Cupid, and all those lovely white shadows...all set off by a perfectly crinkled bow. Yummy! This is absolutely stunning, Linda! LOVE all those awesome layers of beauty you've got going on! 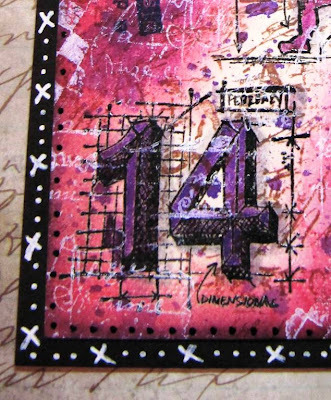 Fabulous, love ALL your details... the pop-out purple 14 is amazing, that background... woo...that's awesome! I love those blueprints ( didn't think I would), I got the Valentine set and a set of minis too !! What a gorgeous tag Linda! Of course I think all of your work is gorgeous! You so inspire me, and I thank you so much for sharing your beautiful creativity with us! I love the colors of this tag and how you combined all of the stamps and blended the colors! I also love the fact that you mounted it onto the black chipboard,that really help it to pop along with the clever xo border! Great Valentine celebration happening on your tag!!! It's gorgeous and I love that you backed it with chipboard!!! YAY! My work is done!!!!! Beautiful! Love all the layers! I would have never thought to run that interrupted script over the stamped image. It looks wonderful and really doesn't distract from the image at all. I also love the shading behind the stamps. Wow I'm so glad Tim sent me here I learned two new things. Gorgeous layer upon layer! Love the border too! What a fabulously striking tag!!! Fabulous tag. Congrats on making Tim's blog. You already know I love this, but I'll tell you again!! It's scrumptious! I am in love with your tag! Gorgeous colors and design. Amazing art, as always Linda. I love everything you do. This tag is no exception. Such great color and texture and depth. Love it! Uterly and totally stunning! LOVE, LOVE, LOVE!!! Beautiful tag, LInda. Love how you melded your style with a kind of shabby chic look. I'll be referring back to this post when I hit the craft room! Thanks for posting this. FABULOUS tag!!! Isn't it fun to just sit and do something you can finish in the same day???? An amazing work of art, this tag is truly stunning. TFS and congrats on your Tim Blogworthy link. This is so fabulous! Must pin it right this moment. Love your colors and layers. I missed this when you posted so I'm extra glad Tim shared it. Hugs! So pretty! I love the background and all the texture you achieved. Your ribbon is such a lovely addition (love how it kept its scrunchieness (is that a word?).. This is absolutely lovely, dear Linda! the purple and white really make it POP!